Do you find yourself looking at weeds in your rock areas? You might wonder, "How can that be?" Well in New Mexico we have plenty of wind that moves just enough dirt and weed seeds into all the rock crevices that can encourage germination of these unwanted plants. In order to combat this problem we have a Non Turf Application Program. A combination of pre-emergent and spot spraying will help to keep the weeds under control year-round. 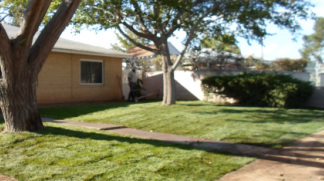 We come out to your residence 4 times a year to ensure that the weeds are kept to a minimum. Keeping your Lawn Green and beautiful is our goal with the fertilization program. Applying the right fertilizer at the right time of the year is essential to having a healthy lawn. Our program begins in February with a fertilizer and pre-emergent combination application. This is designed to help prevent weeds from germinating while feeding and preparing your lawn for the growing season. This is followed by a series of fertilizer applications that are appropriate for the growing season. Weeds that do happen to come up will be treated during these subsequent visits. The season ends in October-November with a Winterizer that we suggest be applied after aerating your lawn to help your lawn retain nutrients over the winter giving it a head start for the spring. Our applicators are trained and licensed by the New Mexico Department of Agriculture.